I recently realized that there are quite few people who want to learn more about their last name meanings and origins. Learning about our surname seems to satisfy a deep urge to connect with our own personal family identity. Being a firm believer that everyone should be proud of their heritage, I wanted help support these folks in their search for more information. I decided to do a survey of what is available on the Internet and compile a list of the four best websites for researching your last name meanings and origins. I limited my search to websites that allowed queries of their data free of charge. 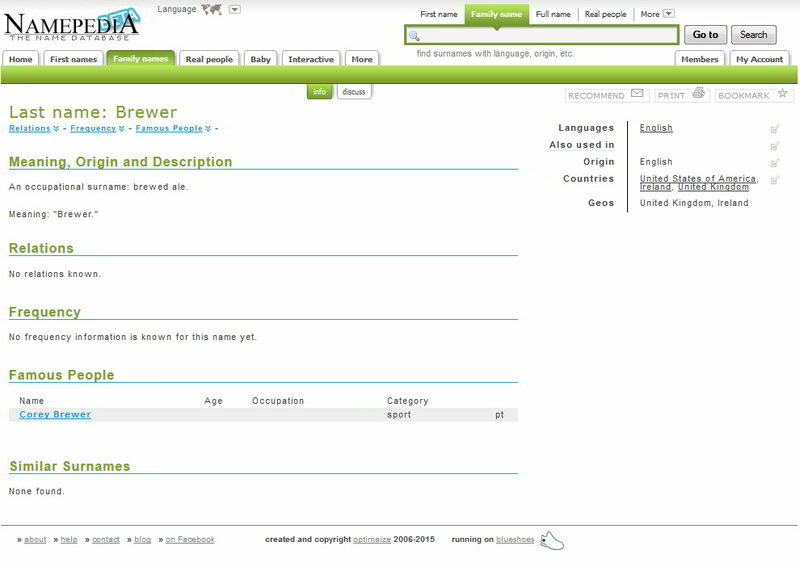 For each website, I performed a search on the family name of “Brewer” and provided a screen capture of what was returned. Doing the same query on each allows a fair comparison to be made of the results returned by each website. All four websites basically work the same, you enter your last name in the search box and see what comes back. Listed below, in no particular order are the results of the survey and websites found to offer origins of last names. 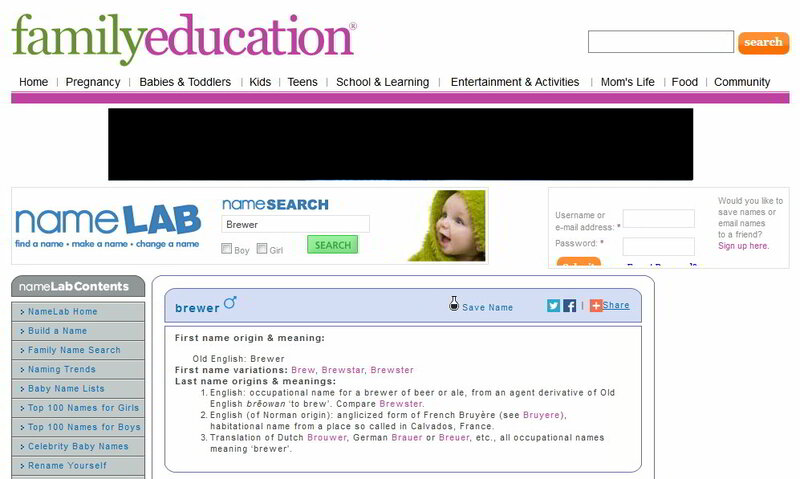 This website returned what appeared to be a formal dictionary version of the Brewer last name origin. One unique feature is the option of browsing surnames by country, which is useful if you know your last name’s country of origin. This website returned a ton of useful information (more than any other) about the surname including a world map showing which countries your surname appears in and a detailed surname meaning pulled from multiple sources, variants, references and footnotes. 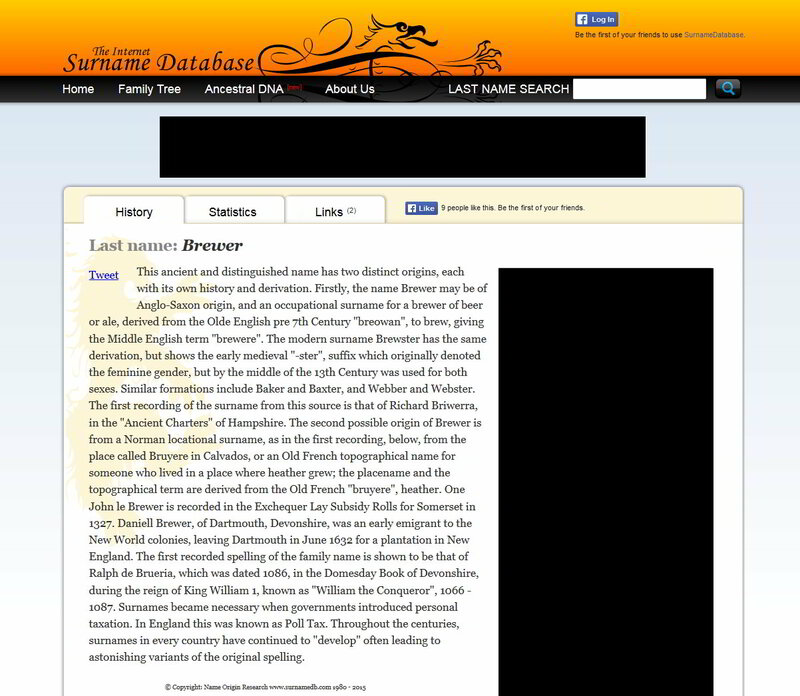 This site produced an impressive historical narrative of the Brewer last name and even provided a link so you could tweet your results to other family members. Just like Wkipedia, Namepedia accepts its input from regular people. Some do not trust the accuracy of the Wikipedia model, but if you have a less than common surname, you can at least see if they have an entry for your name. In this case, a poorly sourced clue is better than nothing. The only catch to using these tools is that each is only as good as the data that populates their database. The variety and depth of each site’s database turned out to be the real differentiating factor. 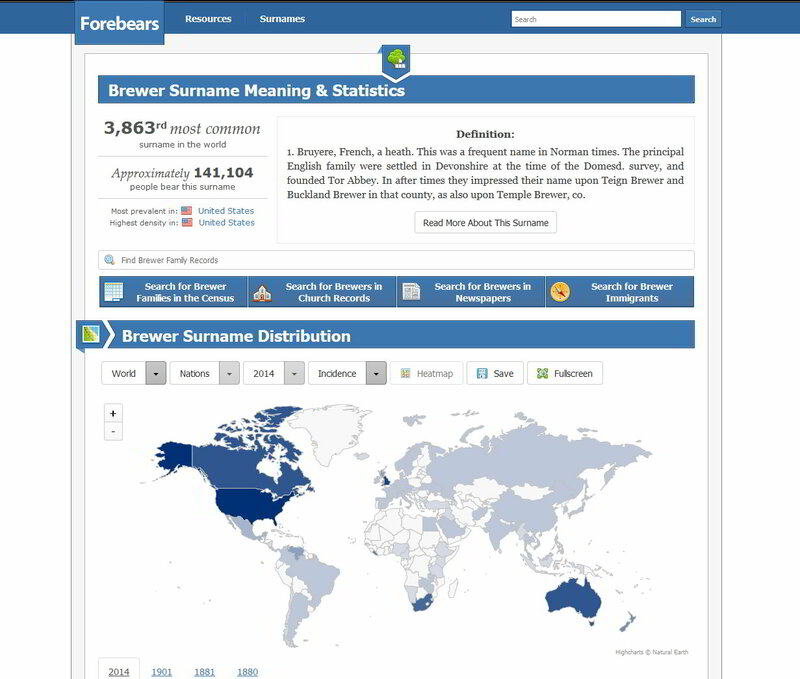 All four websites performed as advertised returning information on the Brewer surname, but results vary when the surname is less common. If your surname is rare and not listed in any of these databases, you are pretty much out of luck. Keep searching for new and different resources. 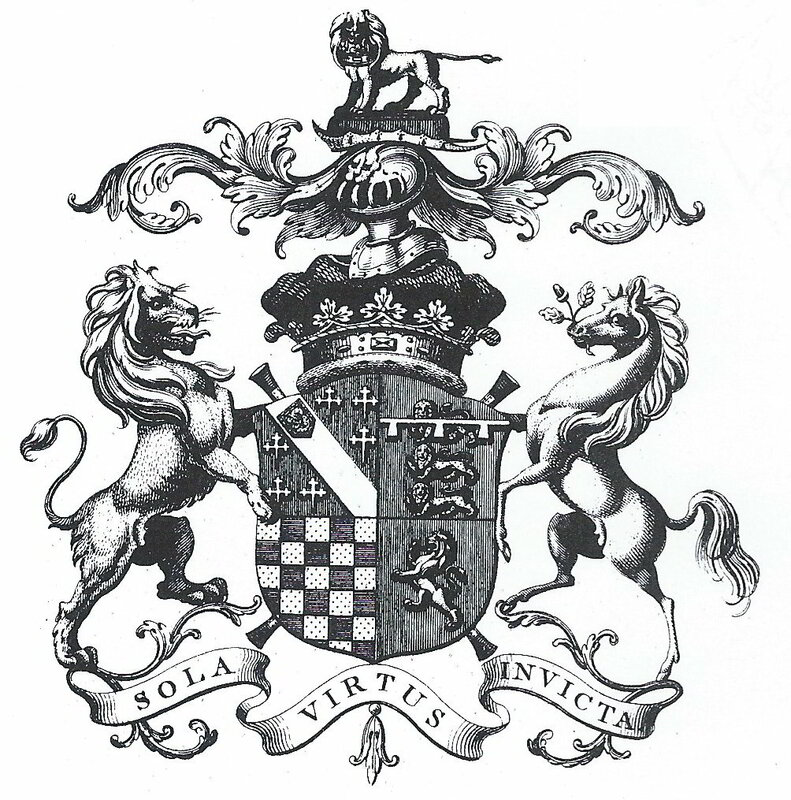 If your surname happens to be listed in one or more website, then congratulations, you have won the equivalent of the genealogy lottery so enjoying the spoils of your victory.